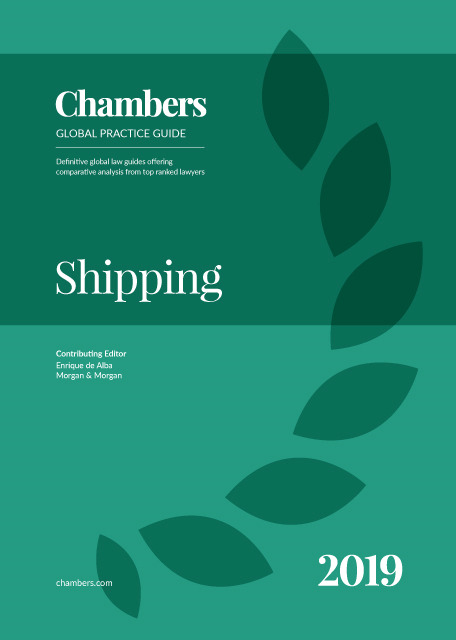 The Shipping 2019 guide provides expert legal commentary on key issues for businesses. The guide covers the important developments in the most significant jurisdictions. Morgan & Morgan leads the shipping sector as Resident Agent of 23.8% of Panama flag ships (1,757). According to figures of the Panama Maritime Authority as of 11 January 2019, Panama has the largest maritime registry in the world with 7,371 ships. The firm's main practice areas are ship finance and registration, and shipping and admiralty litigation; the firm regularly advises clients on financing transactions, including drafting and registration of Panamanian law security documentation, attendance of closings, issuance of legal opinions on binding effects of transactions documents in Panamanian companies, corporate authorities and registration of naval mortgages. Morgan & Morgan's attorneys are specialists in all kinds of maritime dispute resolution and claims at the maritime courts, including collision, cargo, oil spill pollution, charter party disputes, personal injury, maritime liens, marine insurance claims, and ship mortgage executions. The firm would like to acknowledge the contribution made by Luis Raven to writing the questionnaire for this Guide. This new edition of the 2019 shipping Guide falls in line with the introduction of the previous edition in which the key word to the shipping industry continues to be “consolidation” of shipping alliances: Maersk with MSC and HMM; CMA-CGM with Cosco Group, OOCL and Evergreen; Hapag Lloyd with NYK, Yang Ming, MOL and K-Line, collectively accounting for more than 79% of the container carriers market, making good our previous comment on how conglomerates will dominate global shipping in the future. For the tankers segment, the word “consolidation” also applies, with the merger of Euronav (NYSE: EURN) and Gener8 Maritime (NYSE: GNRT) in order to minimise losses that are still owed to the oversupply of tonnage and low hire rates in this sector of the shipping market. The crisis which is facing the shipping industry is not over, however; some sectors have been affected more than others, especially containers and crude-oil carriers. The economic stand-off between the United States of America and China on exports and imports tariff is also another factor that is affecting and will affect further the free flow of commodities, making it even harder for the industry to achieve a stable condition. The LNG and LPG sectors continue unaffected, developing as predicted. Technology will continue to play an important part in the performance of the shipping industry and markets positioning among the major shipping conglomerates, leading us to the following conclusion: consolidation of the major players and innovation with technology, and the most advanced techniques to capture required data, will be necessary in order to survive the coming years. The industry has seen drastic defaulting scenarios in recent years, with Hanjin Shipping and Korea Line in the forefront other smaller players looking for bankruptcy proceedings in several jurisdictions, and filing for Chapter 11 in the United States of America. As Korean shipping companies have been experiencing the brunt of the crisis, the South Korean Government has responded with a five-year plan to revive their maritime industry, creating a new entity named the Korean Ocean Business Corporation (“KOBC”), responsible for granting the required financial guarantees to Korean ship-owners, with capital of approximately USD4.5 billion dollars, responsible for financing new-build vessels (more than 200), injecting fresh funds into the shipping industry and, in addition, responsible for monitoring and restructuring deals. In all of these difficult financial situations, jurisdictions and their pertinent substantive applicable law continue to play an important role. In the segment of ship finance, the word “restructure” is the major player, where companies worldwide are opting to restructure their finance arrangements with the banks in order to avoid court proceedings. Those shipping companies that have opted to go to court face the dilemma of lenders sustaining heavy losses due to the low prices that will be obtained when the required judicial sale of the vessels takes place. Before they do that, banks will have tried to sell their loans to other banking institutions or creditors in order to minimise their losses. A useful tool has been the use by jurisdictions of the possibility within the mortgage contracts to sell the assets (the ships) privately, avoiding court proceedings which are time-consuming and expensive. Besides the banks, there are other players in the market fulfilling the lenders sector which provides the required funds in order to cover the debts, whether they be private equity structures, bond-holders, family funds or governmental financing entities. Some jurisdictions have enacted new maritime finance laws creating incentives on fiscal, labour and immigration activities to those businesses that engage in ship finance and those entities that will develop maritime projects related to ship financing. Entities such as general licensed banks, international licensed banks or representative licensed banks and entities structured in order to carry out a ship-finance deal, such as leasing companies and entities engaged in ship finance as private equity consortiums, will be among the players that can obtain such useful incentives, especially while the industry continues to face a shipping crisis. This edition of the 2019 shipping Guide focuses on important legal aspects that a ship-owner or creditor should take into consideration when requiring the use of court proceedings to achieve the best of results in a given maritime litigation. iii) both of these jointly. if the corresponding credit is recognisable as a bid during the judicial sale auction. Jurisdictions such as South Africa, Australia, the United States of America, Hong Kong and Panama seem to be among the players that come into mind when making ship arrests, not only due to their legal infrastructure, but to their ideal geographical position as well. The easier, cheapest, fastest and more secured jurisdictions (useful substantive law) are most likely to become the preferred ones to arrest vessels and resolve the shipping dispute in question. Following comments on what difficulties are the shipping industry facing nowadays, we call special attention to legal issues experts from different countries should be focusing on when advising their respective clients through this turbulent period of unruling seas. Certainly, ship finance is one of these topics when advising owners or bankers (lenders). It is important where they register their fleets, so that their interests will be best protected by lowering costs, easing up in manning restrictions and ownership nationality, a system based on payment of fixed taxes and not on earnings and a jurisdiction that will allow the highest priority ranking status to a ship mortgage and rules that will allow the pledge of shares to take place in an expeditious and most secure manner. Certainly, a jurisdiction whose naval mortgage will rank only after the judicial expenses caused in pursuit of the common interest of the maritime creditors; the expenses, indemnities and salaries for assistance and salvage; and the salaries, retributions and indemnities owed to the captain and crew members, will be one to be chosen as well as one having a ship mortgage that will allow private sales to take place. If not, a jurisdiction that will take the least amount of time to carry out a judicial sale. Special attention should be taken care on jurisdictions where limitation of liability for maritime claims would be available, taken as a guide the application of international conventions such as the one on Limitation of Liability for Maritime Claims 1976 and its 1996 Protocol. A number of questions have been posed on maritime claims, whose answers in any given jurisdiction will be of substantial help to the legal practitioners to the shipping industry. On the judicial sale of vessels procedure segment, comments have been already made highlighting what are considered to be useful maritime arrest and litigation jurisdictions. On cargo contracts, it is important to choose which contract will be advantageous to the parties on a carriage of goods by sea scenario. Conventions should be taken in consideration that could be applicable depending on the contract, which could be the Carriage of Goods at Sea (“COGSA”), the Hague-Visby Rules, the Hamburg Rules and if not a party to a given convention, rules that will be applicable to the cargo claim. Clauses on a bill of lading would be looked at to sort out the carriers and shippers’ responsibilities. Also, a segment on marine accidents in waterways is included in the questionnaire. A good example is the Panama Canal now that it has been enlarged and is one of the most important commercial waterways in the world. The same will be applicable to the Suez Canal which has its own procedures and rules. Applicable to the Panama Canal, accidents are investigated by a Board of Local Inspectors which involves substantial damage to any structure, plant or equipment of the Canal or involving death, or resulting in personal injury, that requires admission of the injured person to a hospital as a bed patient; or resulting in damage to a vessel which needs repairs prior to the vessel’s departure from Canal waters, provided that Canal personnel or equipment were on board, or assisting the vessel involved in the accident, or were so situated so as to have been a factor in the accident. The outcome of such investigations is subject to be appealed before the respective Maritime Courts. After considering all the commercial and legal aspects to which the shipping industry is going through, the key issue for different sectors of the shipping industry continues to remain the same “consolidation of shipping alliances” be this in the container cargo or tanker segments. This is helping the industry to sail through the shipping crisis faced with over supply of tonnage, lower charter hires and bunker prices. Obviously, politics can and will affect the shipping industry and it is still unpredictable the consequences that may arise out of the commercial war between the world super powers, the United States of America and China. As well as sanctions against oil supplying countries like Iran and Saudi Arabia. Even though there are serious circumstances affecting the shipping industry and their players, they somehow always find ways to come out into better seas. After all, the world cannot subsist without the shipping industry.